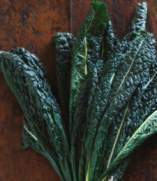 Before we get into the recipe in the title bar, let’s talk about Cavolo Nero, or Tuscan Kale as folks often refer to it This vegetable is in abundance in the part of California where we live, and seems to be in the Farmer’s markets and better food markets most of the year. We never seem to run our of ways to use it. What immediately comes to mind are a variety of bruschetta, or crostini. Simply boiling it for 3-4 minutes, draining it, adding olive oil, garlic, salt and pepper had using it as an accompaniment to numerous dishes. It can be served cold, warm or hot, and each time the differences in flavors are apparent. Tuscan kale is great in soups, and can be served raw in a salad. If using it in a salad, we would recommend using the smaller tender leaves and removing the large veins prior to eating. Try it, and see what you can come up with in your kitchen. Put a pot of water to boil for the pasta. Set a pot large enough to hold all the Cavolo Nero to boil. While the water is heating, strip each Cavolo Nero [or kale leaf ] of any large veins that are tough. Chop the uncooked leaves coarsely. Boil the Cavolo Nero for 5-6 minutes, or until the leaves have softened but do not fall apart. Drain and allow to cool. Put the Cavolo Nero in a stainless steel bowl, add the chicken or vegetable stock and process with a hand blender. If a hand blender is not available bench blender works fine. Process until most of the leaves have been processed, but stop before all of the leaves have been pureed. Add the 1/3 cup of grated Parmesan cheese, and the 1/4 cup of olive oil. Stir with a spoon, remove from the bowl, and place in a shallow fry pan. Add the pine nuts, and stir with a spatula. Leave the pan on the burner at the lowest possible heat setting. Cook the Orzo pasta until al dente then drain, and place the pasta back into the pot from which it came. As soon as the pasta is al dente, drain and add to the pan with the Cavolo Nero pesto. Turn the heat to high and cook for 20-30 seconds, while stirring vigorously. Put into bowls, and garnish with the rest of the Parmesan cheese. Serve hot. A Syrah goes very well with this easy to make and enjoy summer dish. This Syrah was made of fruit grown on the West side of Paso Robles in a vineyard known for its excellent farming practices. It is a bit more extracted than the 2007 Syrah, but not much. 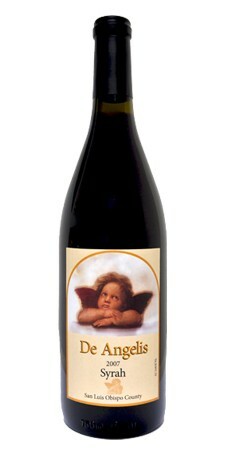 The alcohol is 14.35%, and the wine is perfectly balanced relative to acidity, tannins, and flavor and color. As in our 2007 Syrah we blended a git of Grenache into our Syrah. That added a strawberry finish to the wine, and made it easy to drink, yet a perfect accompaniment for many dishes. There is not much of this wine left. for those who enjoy a perfectly balanced Syrah with a meal,this is the wine of the moment.